Western landscape transports me into another planet. I live in New England, where trees and lakes abound. As much as I love them, I also like to visit places with different scenery. The Joshua tree National Park is a perfect place to experience different. Rocks and Boulders, scanty grasses and the unique Joshua trees and just some of the wonders here. The sun and shade are main actors in this rocky scene. The path leads us into the middle distance shrubs. 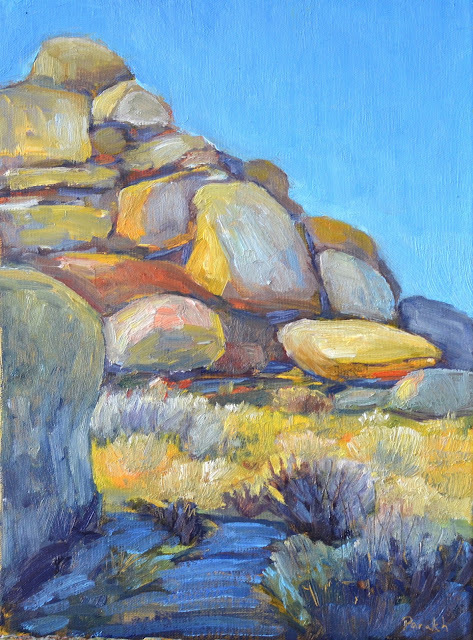 The rocks are sunlit, but the shadow areas get reflected light from adjacent boulders, hence the saturated reds and oranges.